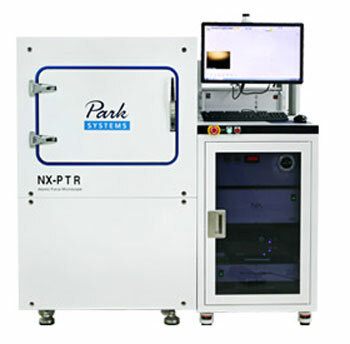 (Nanowerk News) Park Systems, a leading manufacturer of atomic force microscopy (AFM) products, proudly introduces itsnext generation NX-PTR, a fully automated system for hard disk drive slider manufacturing. Newly developed in collaboration with leaders in the hard disk drive (HDD) production, Park's NX-PTR increases production yield by 200% with an enhanced automation routine, faster scan rate and recipe automation. Park NX-PTR AFM Nanometrology Pole Tip Recession (PTR) measurements for inline HDD slider. "Due to the design of traditional AFMs, they display intrinsic bowing in the range of 50nm over the 20µm scan. This can be corrected for by subtracting a best-fit second- or third-order plane, but this makes the measurement of PTR (typically around 1 nm) more of an art than a science for most instruments. Park NX-PTR is designed and optimized for inline slider metrology, providing a highly orthogonal and flat scan with adequate repeatability and accuracy for precision nanometrology. Also, in True Non-Contact™ mode, tip-sample interaction is very weak, which minimizes wear on both the tip and the sample during scanning."